Volvo's passion for safety also extends to issues of personal security. The Volvo XC90 is fitted as standard with a wide range of features designed to protect occupants from burglary, theft and assault. An electronic immobiliser makes it impossible to start the car without the right key, while the outer lock cylinder rotates, making it difficult to break in to. If the thief does manage to get in, via a window, for example, the deadlock system makes it impossible to open a door from the inside. The availability of laminated side windows can also make it harder for thieves to gain access to a Volvo XC90, while dark-tinted rear windows protect the car's contents and aid personal security. The deadlock system is activated by the remote control key fob, allowing the driver to open the car as they approach. This system can also be used to access the tailgate independently of the doors, which is a useful deterrent to opportunist thieves. 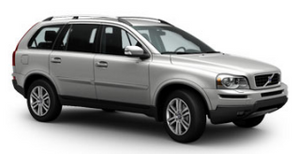 The same remote control system also switches on the alarm system, which is fitted as standard to the Volvo XC90. The alarm is triggered if anyone attempts to open the doors, the bonnet or the tailgate. It also reacts to movement inside the car or if a window is broken.